The Justice Sector Coordinating Council (JSCC), in coordination with the European Union GOJUST program, has launched the Justice Zone in the city. The JSCC is composed of the Supreme Court (SC), the Department of Interior and Local Government (DILG) and the Department of Justice (DOJ). The initiative is the first in Mindanao and the third in the country after Quezon City and Cebu City. Chief Justice Lucas Bersamin, DILG Sec. Eduardo Año and DOJ Sec. Manuel Guevara were present during the launching of the project that aims to decongest courts and jails. The program also aims to automate court proceedings and to institutionalize coordination among justice sector agencies. “The City has to be launched as a justice zone because the city is a very ideal zone for testing the objectives of justice zones. 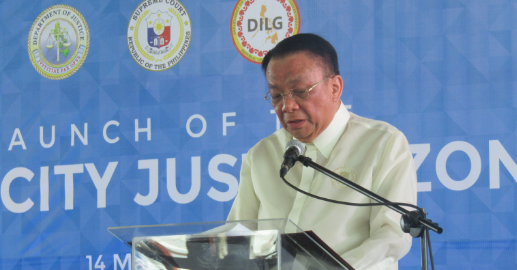 The justice zone is the testing ground for the objectives to be implemented that are adopted by the justice sector – SC, DOJ, and DILG,” Bersamin said in an interview after the launching event. The justice sector includes the trial courts, city and provincial prosecutor’s office, the public attorney’s office and the local police and jail centers. Trial courts are under the SC. The prosecutor’s offices and the public attorney’s offices are under DOJ while DILG handles the police and the jail offices. Bersamin said the initiatives for judicial reforms have to be tested yet in the field. “Only by testing in real time situations may such initiatives be properly judged for their potential,” said Bersamin. The reform initiatives include the automated hearing systems in the trial courts, the e-subpoena for the police, the e-dalaw for jail visitations and the continuing jail decongesting efforts. Bersamin is positive that court dockets in Davao will be decongested. He said the two initially established justice zones in Quezon City and Cebu City, respectively, have resulted in the decongesting court dockets. Bersamin, in his speech also called for speedy actions on cases.